Enjoy summer with this great deal only at The Green Goddess! Come visit The Green Goddess to receive 20% off ONE plant of your choice! Summer special will not last long, click below to download your coupon today! This evergreen grows up to six feet high and six feet wide. It has multi trunks and matures very quickly with bright green foliage.This colorful bush produces orange-red tubular blossoms that bloom in the spring right through the heart of the summer months. These blossoms are a favorite of hummingbirds! In the fall this bush is a favorite of many different kinds of birds by producing small black-purple fruit. This plant provides a lot of summer color and is a great plant to put on patios, in atrium’s, around pools, ponds and fountains. This hardy plant defoliates if temperatures fall into the 20’s or low 30’s. With strong roots this very colorful plant will survive. It comes back quickly from light frost conditions. 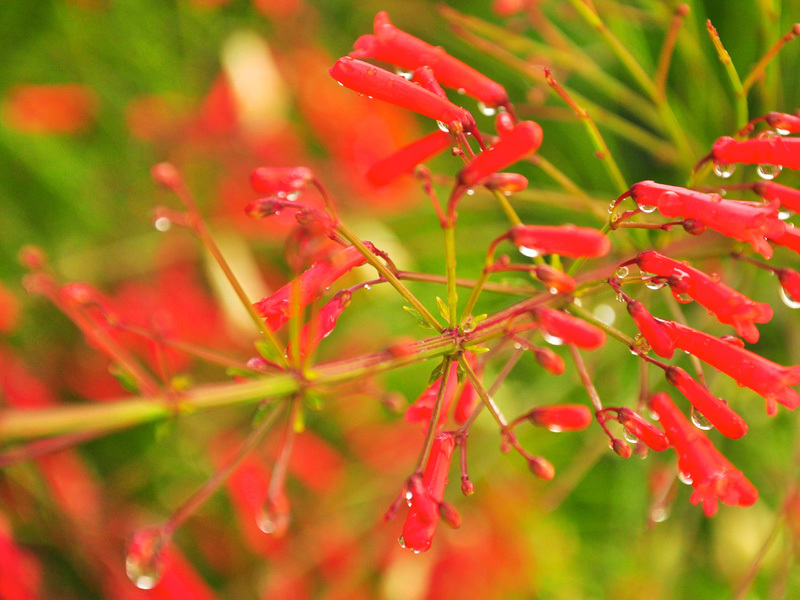 Either full sun or reflected heat are good for the firecracker bush along with moderate water. Many different kinds of soil can be used for this plant as long as draining is sufficient. Fertilizing in early spring and prune as needed. The firecracker bush is a great addition to any landscape. It is a great indicator as whether your area is getting enough water because its leaves will wilt, but will return quickly with sufficient irrigation. With summer in full swing, it is important to make sure your landscape gets enough water. Check your plants and garden to make sure all your drippers are working and not clogged. Doing this every few weeks is a good idea over the summer. Thoroughly look over your irrigation system. Make sure nothing has popped off, with the warmer weather hoses get soft and can break free. Deep water your trees; it is important for the roots to get water and they can grow very deep. Whether you have an irrigation system or water by hand, keeping plants watered during the summer heat is essential! 2-3 large fillets of salmon. Light your grill (325 degrees). Put salmon on foil skin side down. Place foil/salmon on grill and cook 10-15 minutes or until done. Baste with teriyaki sauce and sprinkle with sesame seeds. The salmon should peel right off the skin once it is fully cooked. An easy homemade teriyaki sauce, this is a great marinade for the salmon recipe. Combine 1 cup water, brown sugar, soy sauce, honey, garlic and ginger in a medium saucepan and set over medium heat. In a small bowl, combine the cornstarch with the 1/4 cup water and whisk until dissolved. Add the cornstarch mixture to the saucepan. Heat the sauce until it thickens to your desired thickness. If the sauce becomes too thick, add more water to thin it out.